I already was accepted for UKOUG 2008 Conference with my paper - ADF Task Flow - Based On Practical JDeveloper 11g Experience. However, during last week in San Francisco (Oracle OpenWorld), I got a phone call from UKOUG office and was invited to deliver second presentation on UKOUG 2008. They have asked to present similar session as I was doing on OpenWorld, Oracle Develop track - My Session at Oracle Open World 2008 (Oracle Develop). It is about Oracle Maps integration with ADF in JDeveloper 11g. See you during UKOUG 2008, it will be really fun ! This week I'm in San Francisco, attending Oracle OpenWorld 2008 conference. One of the main news for me, announced on Ted Farrell keynote - Breaking Enterprise Application Platform Barriers, was a date of JDeveloper 11g production release - October 1. I already can start to play with it, Oracle provided private ACE Directors build on September 21. As you see, JDeveloper/ADF is Oracle's strategic tool and framework. Enterprise Pack for Eclipse is second strategic tool, designed for core Java developers. In 11g, ADF becomes really rich framework, with support for WebCenter Services, View layer with JSF Core, Data Visualization, GeoMap and Data Manipulation. ADF can render View layer on different devices, in the future there will be support for iPhone as well. I'm again back to one of most popular topics on my blog - CRUD implementation in ADF. I was blogging previously about CRUD in 10g and also about CRUD in 11g af:table component - JDeveloper 11g - Create, Edit and Delete operations in ADF Faces af:table component. Today I want to describe CRUD in ADF Form implementation, it is different comparing to ADF Table implementation. Actually, its easy to implement CRUD operations in ADF Form, however it can be complex to implement user friendly CRUD behavior. Main focus of my blog post will be to describe how to achieve user friendly CRUD behavior with ADF Form component. This post is based on sample application I have developed - UndoCreate.zip. Sample is based on standard HR schema, before running application make sure you have correct DB connection defined. I'm clearing previous query parameters by executing combination of Rollback, Find, Delete and Create actions in backing bean findButton_action() method associated with Find button. 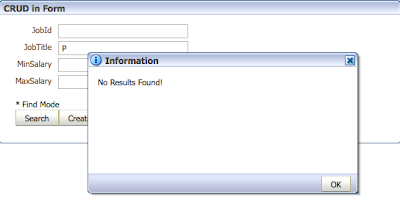 In this case I'm not clearing entered query criteria. By default, when Undo button is pressed while in Edit mode and Rollback action is executed, changes will be discarded and at the same time form will be refreshed and will show first row from iterator. This means, user will be navigate from a row he is currently editing to a first row in iterator. In this code, I'm acquiring form related iterator, getting current row user is editing and refreshing it. At the end, I'm applying Partial refresh to a form in order to display correct data. More information about Rollback functionality you can find in Chris Muir blog post - JDeveloper and the art of the rollback. The same functionality can be applied not only in 11g, but in 10g as well. 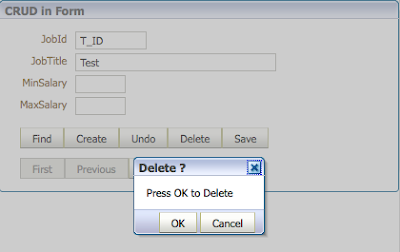 When user confirms Delete action, Commit action is executed at the same time, and row is removed from database. Information about pending changes is retrieved from bindings.Commit.enabled using Expression Language. Its enough to edit data available in the form and bindings.Commit.enabled will return true.